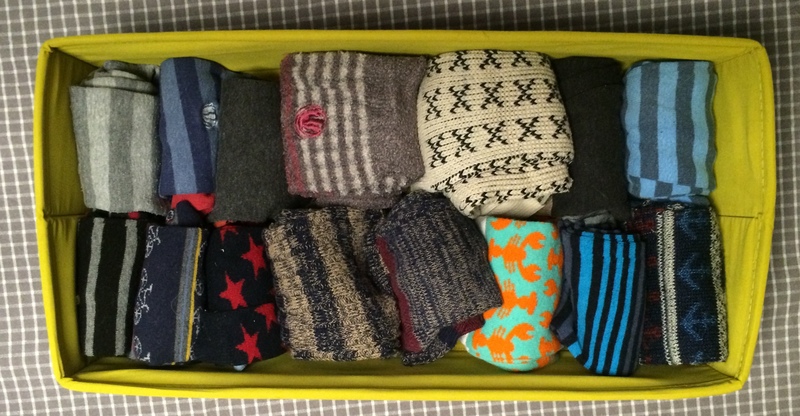 Find inner happiness through folding your socks - Well Dressed Dad - It is a proper menswear blog. Like, with original words and opinions and suchlike. A word of warning: The next lines you read may provoke either a physical or mental reaction in you, or even both in extreme cases. Fear not though, keep reading and all will become clear. I will help you work through the trauma I about to induce in you. How often do you get both the poison and the cure in one sitting, you’re thinking? I’m all about providing superb value for money. Known for it, in fact. An absolutely authentic sight in many dwellings. 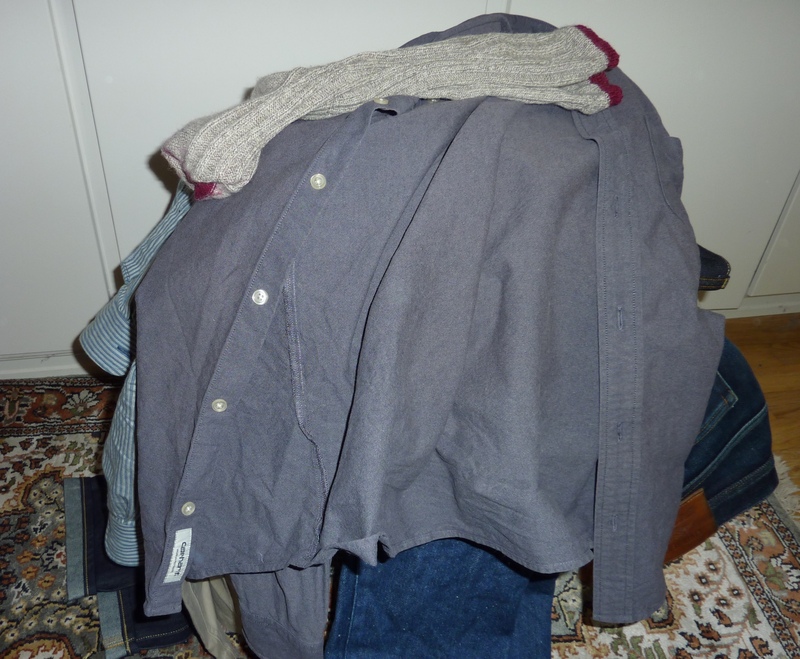 The male has tidied his clothes at the end of a day, many days in a row. So, warning provided, let’s get down and dirty. Today it’s all about tidying and sorting things. Usually this will have a chap either making for the doorway, or pretending to fall into a deep sleep. Never have the following words been uttered “Why, dear, that sounds like a splendid idea! Tidy my clothes and get rid of a large portion of them? Champion, pet!”. Am I right, or am I right? Add in that some of what I’m going to continue with is also trending massively in social media and women’s magazines, and you’ll understand that selling in todays topic is a pretty bleak prospect for yours truly. Except, I’m going about it in a different way. Let’s just stick to the tidying side of it. No more than that. I’ll demonstrate this by showing you a typical situation, a slightly better situation, and then gently nudge you onto the path to true enlightenment. And you’ll not have to get rid of anything, yet your life will be improve to a greater extent than the effort you put into it. You could buy this book, if you’re really keen. It is a fact of life that to tidy, or place items into a system whereby you force order into chaos, you need somewhere to put stuff. I have a small chair in my bedroom that is very handy for dropping clothes onto come nighttime. I might describe this as tidying, but after a week the pile is high and sliding onto the floor. From a perspective of practicality it works fine, but in reality it’s a really weak way to tidy. Plus it fails totally when I want the pair of jeans I wore 4 days ago again. So we need a way of doing it that takes almost no time or effort at all. As close to dropping a garment onto a chair as we can get. And I reckon that crazy Japanese woman whose name we shall not mention (in case Google picks up this piece of counter-culture and our cunning scheme is revealed to all of womankind, ok?) 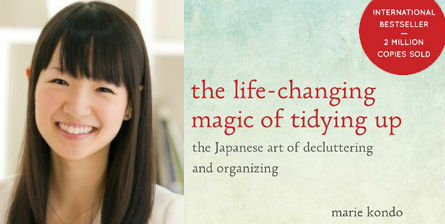 is onto something with her seemingly complicated techniques for folding things. It’s not all that tricky though, we’re not talking the Origami of Garments here. 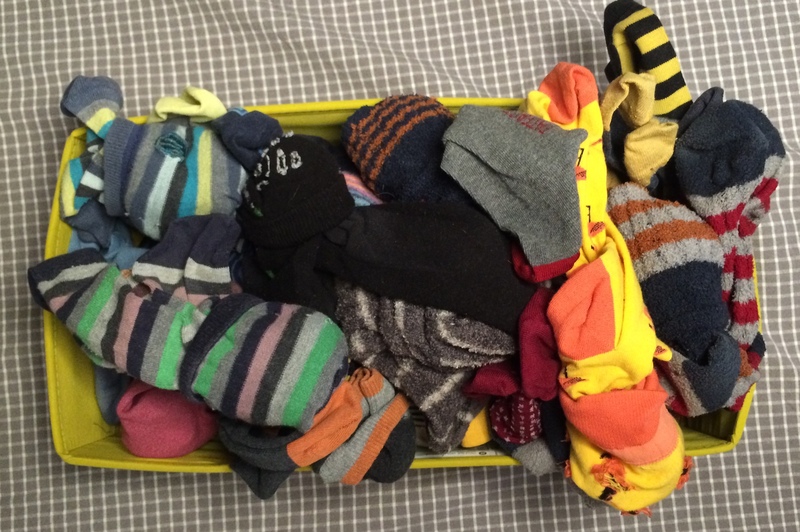 I’m sorry to say that so far I only have a solution for trousers, t-shirts, underwear and socks though. Shirts, jackets and shoes are still without a workable technique. Still, half way there is still a lot better than where we were! And, at this point I will sneak in a quick mention of how while tidying you may find stuff you had forgotten you had, no longer care about and quite frankly would not miss, and how Project 333 might be quite fun. You will probably also enjoy my previous post on bubble sorting your wardrobe, as another step on your way. Or maybe you didn’t get this far, in which case my words are in the wind. And while it may be a little Sheldon Cooper, it does make quite the change, and believe me, it truly does bring inner peace. Fear not though, I’m not about to go full ohm on you, I’m back tomorrow with more tweed. You have to be kidding, the 333 project??? Is there a relationship between quality and cost? Anniversary- Well Dressed Dad is 5 years old!